For two years chip and pin cards have been the British standard. Introduced in 2004 to help combat the increase in card fraud the Chip and Pin debit and credit card has been under criticism since the very beginning. Three years in, we ask whether it's been a security blunder - and how you can safeguard your accounts. How Can Chip and Pin Debit And Credit Cards Be Misused? In 2006 Lloyds TSB admitted their customers had been subject to card fraud on a wide scale. Because overseas ATMs had not yet been replaced to suit the new-style cards, fraudsters were able to clone existing cards and withdraw cash. The Chip and Pin debit and credit cards are embedded with a microchip which makes them very difficult to clone; but ATMs in some European countries are not yet equipped to read these chips. Fraudsters were able to clone the card's magnetic strip and take thousands of pounds from unwitting Brits. Three Shell petrol stations were targeted using this method in 2006. Experts say that a device was implanted into each of the handheld machines that read customer Chip and Pin debit and credit cards, which then recorded hundreds of card numbers and PINs. £1million was stolen from customer accounts before Shell became aware of the problem. Similar 'skimming' devices and miniature cameras have been attached to ATM machines, prompting banks and supermarkets to replace their machines with newer versions. Master forger Frank Abagnale brought a device that can intercept Pin signals to the media's attention in 2006. Abagnale, the real-life fraudster of the film Catch Me If You Can and consultant to the FBI for the last 30 years, explained that handheld PIN machines used in restaurants and bars transmit a wireless signal that is all too easy to intercept. Devices are actually available online - these are designed to collect your card number and PIN from a wireless signal. What's The Risk With Chip And Pin Cards? Although newspapers dramatise the risks presented by Chip and Pin, the figures aren't as promising as they might be. One year after the new Chip and Pin debit and credit cards were introduced, card fraud reduced by 13%: a fairly poor figure compared with industry predictions. The same year, APACS reported an increase of 21% in fraud over the internet and telephone - methods where no Chip or Pin are required. With banks slowly improving the technology at ATMs here and abroad, the risks should start to decline. But it's important to do what you can to keep your Chip and Pin card safe. Look around when you use an ATM. 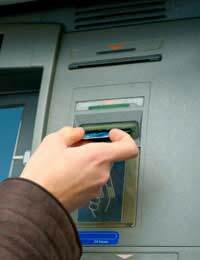 If someone is standing too close, they might be 'shoulder-surfing' (although this is a very rare method) - be safe, and go to a different ATM. Check for attachments on the machine, especially around the card slot. Don't be distracted midway through a transaction, and put your money away before leaving the machine. Here are two top tips for protecting yourself online. First, when you find a new online store, check its background. Where is it based? Read the 'About' section and make sure there is a postal address. How long has it been in business? Are transactions secured by a well-known source? Second: when you do place an order online, check for the security icons: a padlock at the bottom of your browser, a logo for a renowned security brand, and an URL that begins with "https". Shred your card receipts, and keep your cards in a safe place when you're not using them. Keep a different PIN for each Chip and Pin debit or credit card you use, and don't write these down anywhere.